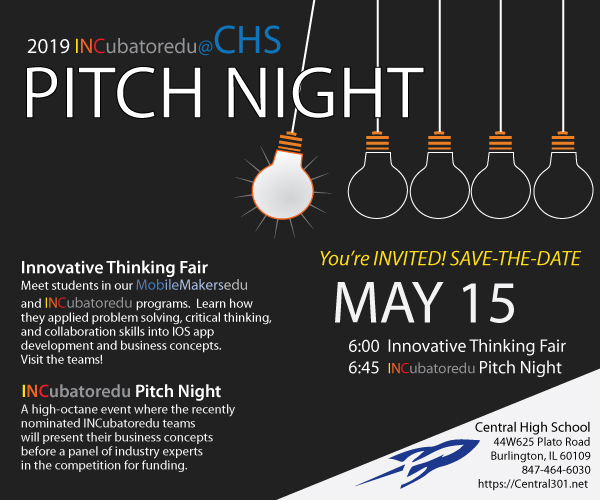 You are invited to join us for our first ever INCubatoredu@CHS Pitch Night! This event will be held on Wednesday, May 15th beginning at 6:00 p.m. at Central High School. The evening will begin with our Innovative Thinking Fair, during which guests can hear from students in the MobileMakeredu and INCubatoredu programs about how they applied problem solving, critical thinking, and collaboration skills into iOS app development and business concepts. Beginning at 6:45, our INCubatoredu teams will present their business concepts before a panel of industry experts in a “Shark Tank” style competition for funding. This is sure to be a great event and we hope you will be a part of it!